In the aftermath of natural disasters, wars, famines, and other crisis situations, those left behind can be left with a deep sense of loss, insecurity, and overwhelming need. 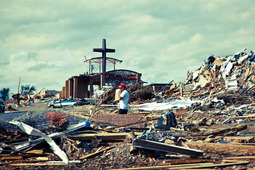 During disasters and emergency situations, NCM partners with local churches as they work to assist people in meeting short-term and long-term needs—both physical and spiritual—regardless of economic status, ethnicity, or religious background. NCM is committed to a holistic approach to emergency relief that includes meeting immediate needs and then walking alongside them on a path toward long-term recovery and stability. We are especially committed to working with churches to care for the most vulnerable individuals and families in their communities. The focus is on communities where the Church of the Nazarene has a presence, but assistance is not limited to Nazarenes or to Christians only. Each emergency relief effort is organized locally with the support of the global church through prayer, giving, and technical support. The local church often partners with other organizations and local government agencies in order to best meet needs as well. Your gift to the NCM Global Emergency Relief Fund will enable local churches to strategically organize immediate relief and long-term rebuilding projects for communities affected by disasters. Be sure to put ACM1198 in the Memo area. Thanks for your donation.